5 Tips for Moisturized Skin this Winter! It’s finally starting to chill out here in Southern California at night. I love taking a hot shower when it’s cold, but combine that with the dry winds and low humidity and that means dry, itchy skin. Here are five tips to help keep your skin smooth and supple this winter! Don’t take a hot shower. I know, the temptation is there, but take a warm shower. The hot water strips the moisture from your skin. If you love a steamy bathroom, put a bucket in the shower, and turn the water on very hot, allowing the water to be caught in the bucket. Save the water to water your plants or grass with (after it’s cooled). Then when it’s time to hop into the shower, turn the temp down, pull out the bucket and enjoy the steam and a warm shower! Dry brush! Dry brushing is a great way to sweep away dead skin, and increase blood flow. It also helps move lymph through your body, which some people say is one of the keys to a good detox. I use this dry brush set– I love it. Here is a great video about dry brushing. Exfoliate! Using a moisturizing exfoliant will sweep away the dead skin cells, which is what gives your skin that ashy dry appearance. I like the 100% Natural Arabica Coffee Body Scrub from New York Biology. It’s moisturizes with Organic Arabica Seed Oil, Cacao Extract, Organic Sweet Almond Oil, Organic Olive Oil, and Organic Grape Seed Oil. It uses Coffee and salt to scrub away the dead skin cells. Oh, and it smells GREAT! Moisturize! Lock in the moisture from the shower with a high quality body lotion or body butter. Avoid products that contain Mineral Oil, Petroleum, and Petrolatum. These ingredients are not absorbed by your body, but leave an occlusive film on your skin. Some people like using straight Coconut oil. I prefer using the lotion bars from Little Red Howse. Drink Water! I know, you’ve heard that you need 8 glasses a day, but really, it’s important to keep your body hydrated from the inside by making sure you get plenty of liquid! Water is best, but juice, milk, and yes, even coffee count too. Just make sure that you are drinking more non-caffeinated and non-alcoholic beverages, as excessive amounts of both can lead to dehydration or other ill effects. I use these powdered stick beverages in at least 2 of my 20 ounce water glass (which is really just a shaker bottle) each day. You can also infuse water with fruit. I have this pitcher in the fridge with lemons and cucumbers in it right now! I’d love to hear your tips for keeping your skin moisturized this winter! Recently, our bed frame broke. Our bed is nine years old, and our bed frame was the cheap-y one that came free when we bought our mattress and box springs. I shouldn’t really be surprised that it broke, but it did and it was no longer comfortable to sleep in our bed. It’s sagged in the middle because the part of the bed frame that broke was the center slat that provided the support for the mid section of the mattress. I began my search online for a new bed frame. I checked all of the usual suspects: JCPenney, Sears, as well as trusty old Craigslist. 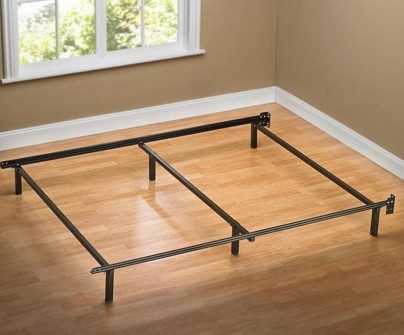 All I wanted was a sturdy metal bed frame. No headboard, no foot board, just a bed frame. Finally I found one that fit the bill. It was this one here from Sears. 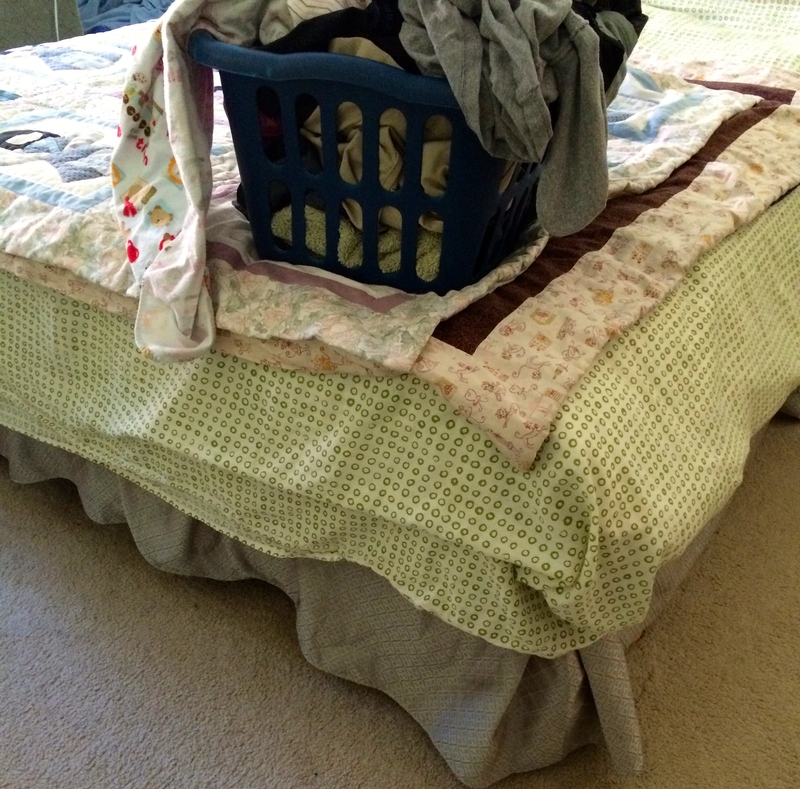 It was sturdy, as it had extra supports in the middle (which is very important when you have a small child likes to bounce on the bed like we do), and it fit my budget. So I set upon trying to get it for cheaply is possible. First, I checked to see if there’s any place I could get a free Sears gift card with points from various rewards programs I use. I checked my Mypoints account, and I checked my SwagBucks account, and finally I checked my RecycleBank account. Turns out I had enough RecycleBank points to get a $10 gift card from Sears. I cashed out my points and a few days later I have received via email a $10 gift card from Sears. Second, I logged onto my Shop Your Way Rewards Account (through Sears.com). If you haven’t signed up for Sears Shop Your Way Rewards, it’s easy! You can do it at any Sears, Sears Outlet, or Kmart location. It’s like any other store club card. Scan your key fob or enter your phone number when you check out and earn points. Points can be redeemed for cash off purchases. Also- Shop Your Way Rewards members get access to great coupons, and sometimes even surprise points (Frequently they send out $5 in points- just for being a member!). I had a $10 off of $50 or more purchase good for anything in the home department, which happens to include bed frames. Third, I logged on to all of my survey websites: PaidViewPoint, and PineCone Research to see if I had points I could cash out for a PayPal payment. It turns out I had over $25 that I could cash out at PaidViewPoint. I requested a PayPal pay out and within six hours I had $27 and change in my PayPal account. I also discovered that I had enough points to cash out for a $15 payment via PayPal through PineCone Research. I requested that as well. I had $42 and change to use! Fourth (And Finally), I also logged on to Top Cashback as well to see if I can earn any cash back for this shopping trip. Turns out I was going to earn a cool 3% cashback on my purchase. The best part is, I earned 3% of my post coupon amount ($38.58) because I shopped through Top Cashback. That’s more free money to use in the future! So I got paid .30 to buy something we really needed! The bed frame was delivered on Friday and I just set it up this morning. And we did give it a good test bounce after the bed with put back together. It’s very sturdy I’m proud to announce. The point of this post isn’t to show off, “Look what I can do isn’t this cool?! ?”, but it’s meant to inspire you and show you that you can-do these things as well. You can get stuff for free. And not just little samples of this and that, but you can actually get things that you need for your home for free. Taking surveys does take time however with PaidViewPoint, and PineCone Research. The surveys that you will do you’ve been pre-selected for, and take less than 10 minutes each. So you’re not wasting time doing surveys you don’t end up qualifying for and the payout for both of those companies is so low you’ll be able to reach a payout in less than a month even if you only do a few surveys for them each week. So there it is. That’s how we got a brand-new bed delivered to our house for free. No smoke, no mirrors, no hocus-pocus, or anything shifty or questionable. Just a brand-new bed frame delivered free. I’d love to hear about the kinds of things that you have gotten for free or really cheap using the profits from surveys or even secret shopping. So leave me a comment and let me know what kind of awesome things you’ve gotten for free! Saving time and money with meal planning! One way to keep on the frugal track is to meal plan. If you’ve never meal planned before, it can seem daunting. Here are just a few tips to get started. Inventory your pantry, freezer, and fridge. I use these worksheets. I keep them in plastic sheaths taped to the fridge and inside the cupboard. That way you know what you’ve got on hand without having to dig. I update them every week. Check out your favorite grocery stores weekly circular online before you hit the market. You may find that chicken is on sale that week- in that case, plan to cook more dishes that involve chicken. To save the most amount of money, eat what is in season and what is on sale! Make a list of the types of dishes that your family already enjoys. Make a list of the ingredients for each recipe. Check off the ingredients you already have on hand. Gather up some recipes that you’ve wanted to try for a while. Make a list of the ingredients the recipes call for that you don’t have on hand. I try to add in one new recipe each week. Decide what you want to cook for dinner each night (based on what’s on sale, recipes your family likes, and maybe 1-2 recipes that you’d like to try that are new to you). I try to have one night where we eat up leftovers. I also make a green salad to go with dinner that night. Plan on having the ingredients for a few easy meals on reserve in the pantry/freezer. Sometimes your day goes south and you don’t have the time/energy to make what’s on the menu for a certain night. Having something easy to make waiting in the wings keeps you out of the drive-thru! I try to plan the extra meals around stuff that we already have in the cupboard. If you don’t have any “extra” food, plan on buying the ingredients for 1 extra meal each week for a month. It can be as simple as a can of soup and grilled cheese- No need to be gourmet every night! Write a list of all of the ingredients that you need for your weeks menu that you do not have on hand. Look online and in inserts for coupons. To save time, use a Coupon Database to locate coupons. I like Couponmom’s Coupon Database– it’s separated by state! It can take a few weeks to a month to get into the meal planning groove. Give yourself grace and realize that it doesn’t come easy to everyone! Now, if that is too much work, there are websites (and companies) dedicated to helping you meal plan. eMeals is one of them- It’s not free, but it’s pretty cheap ($5/week or so). They ask you a bunch of questions about your family, diet, and where you live and they supply you with grocery lists based on your dietary needs and where you live and shop.